A simple eight-bar repeating sequence on two voices, with each CV fed through one channel of the MSK 008. 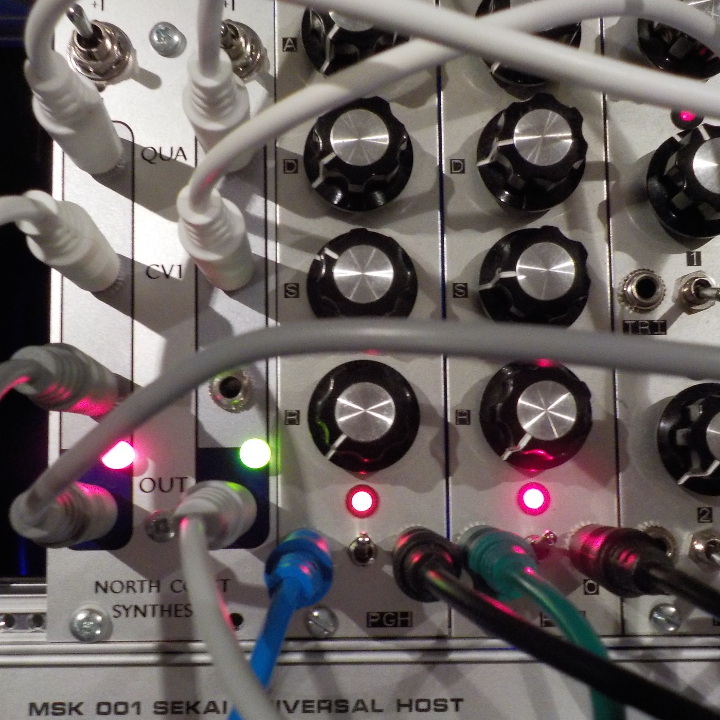 Attenuated sine waves from an MSK 010 drive the quantizer (octave shift) inputs, and another attenuated sine wave through a Penrose Quantizer with a carefully chosen scale drives the CV2 input, which is normalled to both channels, one adding, one subtracting. The trigger input on the Penrose is also sequenced. The result is that octave shifts happen more or less at random (from the unsynchronized sines) but transposition shifts, which change the harmonic structure, happen at musically relevant times and in a way that keeps it all more or less diatonic. The Penrose only handles positive voltages, so the harmony-shifting transpositions choose the raw unshifted sequences about half the time, whenever the sine happens to be negative as the trigger comes in. That keeps it all more or less in key, but with enough chromatic departures to stay interesting.